I recently read an article about little known laws that could be a colossal issue for family caregivers. These statutes are known as filial responsibility laws and are on the books in many states holding adult children, at least on paper, responsible for the financial support of indigent parents for necessities including food, clothing, shelter and, in some cases, medical and nursing home costs. Not every state has these statutes, however; if your parents are currently receiving care or may need care in the future you want to be aware of this. The article stated that if your parent receives care from a nursing facility, or other types of medical care and is not able to pay or passes away, you could be liable for the bill even if you are not the financial power of attorney nor have signed any of the paperwork for their care. 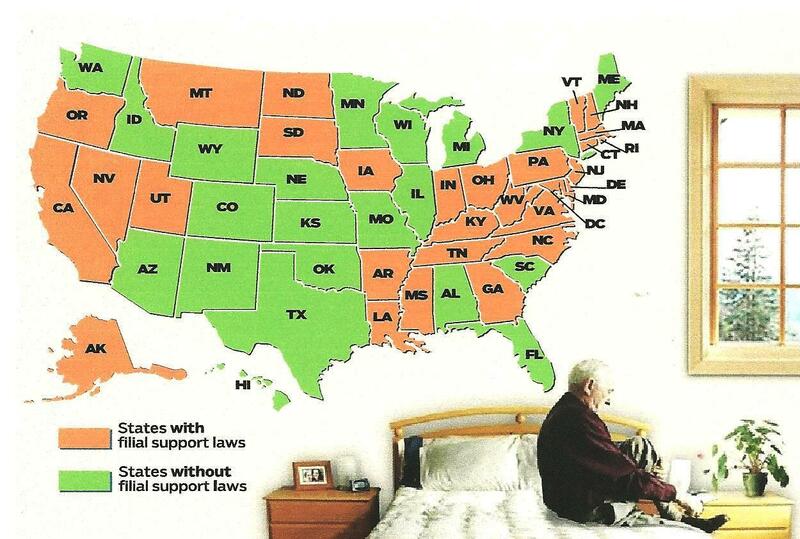 Today, about thirty states have filial responsibility laws requiring adult children, based somewhat on ability, to provide financial support to care for indigent parents. Of these statutes, the most common requires children to reimburse states for some Medicaid nursing home expenses. Generally actual enforcement has occurred only when a parent has tried to give away assets to children in order to “spend down” to Medicaid eligibility to go into a nursing home. I am in no way trying to discourage people from helping their parents if they are able to. I think that everyone should, as best they can, all make an effort to help their parents as they age. However; with the current economy and the financial hardships that many Americans are facing we need to be pro-active in addressing issues that could potentially be detrimental to our personal and family life. Be pro-active – find out if your state has filial responsibility laws and what it says about your role and responsibility. Talk about it – make others aware of the law, as well as speak to your local legislators about how to change the law. Be an advocate for yourself and other caregivers. Disclaimer: I am not a lawyer nor do I play one on TV, so contact an Elder-law attorney if you have questions about this law, as well as, whenever a loved one is receiving care (especially long-term) that requires signing of paperwork. This entry was posted in caregiving, health care, out of pocket, sandwich generation, work/life/flex, working caregiver and tagged caregiving, elder law attorney, eldercare, filial responsibility laws, health care, Healthcare, out of pocket, paying for eldercare, sandwich generation, work/life/flex, working caregiver. Bookmark the permalink.